Liberals in the US are in an uproar, claiming that the recent murder of six individuals and the attempted murder of the Arizona congresswoman Gabrielle Giffords were the by-product of rhetoric by Sarah Palin, Glenn Beck, and/or Rush Limbaugh. One sheriff even claimed it's due to "the rhetoric about hatred, about mistrust of government, about paranoia of how government operates." So from it's list of possible responses, and with the profound irony of what Gabrielle Giffords just recently read in Congress, what does the US government want to do? 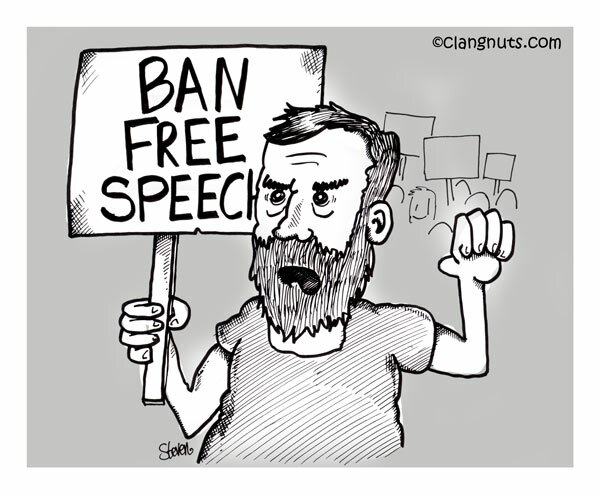 Ban speech of course. Oh, it's not all speech, silly, so don't get so excited. Just "hate" speech. And it's not even just hate speech - it's hate speech against government. Let's ignore for a moment the U.S. Supreme Court's statement in Watts v. United States that "Suppression of speech as an effective police measure is an old, old device, outlawed by our Constitution," or even its Brandenburg v. Ohio ruling that government cannot punish inflammatory speech unless it is directed to inciting and likely to incite imminent lawless action. Let's also ignore for a moment the hypocrisy of the statement by the liberal's key man Obama: "If they bring a knife to the fight, we bring a gun." What does it mean to have freedom of speech? Is freedom of speech a misnomer if there are limits or exceptions? What should the limits on speech be, if any? But let's examine the other presumed guilty parties behind the latest example of violence: namely "mistrust of government" and "rhetoric about hatred." Mistrust of government has a long and respectable history in the United States - and why not? For one thing, there would be no United States if the Founding Fathers had thoroughly "trusted" either King George III or his emissaries. For another, as many of us who have lived through a number of US-led wars have concluded, there is excellent reason to remain perpetually wary of a bellicose government, especially when it keeps changing its rationale for invasion or declares that some mission, never quite specified, has been judiciously accomplished. And finally let's deal with, yes, the term "hate speech" itself. Sounds ugly, doesn't it? And maybe it is. The First Amendment never mentions it, however, as the one instance where it's okay to ban an opinion - and this omission almost certainly is not the result of oversight or forgetfulness. In fact the preamble uses what I'm certain a lot of members of the ADL would consider hate-speech, accusing King George of devising "an absolute tyranny over these States." Can't get more mistrustful than that, can you? In other words, and I say this in the full realization of what nasty rhetoric can do in any nation anywhere, in a country without hate speech there is no free speech.